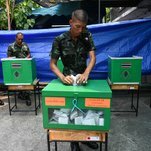 BANGKOK — A military-linked party took an unexpected lead in elections in Thailand on Sunday, most likely cementing the army’s status as the country’s dominant political force. With more than 90 percent of the ballots counted, Palang Pracharat, the military’s proxy party, had 7.5 million votes, according to a preliminary count by the Election Commission. Thailand’s military has orchestrated more than a dozen successful coups, the latest in 2014, and has ruled the country through a junta since then. Pheu Thai, the populist party that had been expected to finish first according to most polls, was in second place with seven million votes, the Election Commission reported. Pheu Thai is the latest incarnation of a populist force that was toppled in the last two coups. The party is a political vehicle of Thaksin Shinawatra, a polarizing former prime minister whose aligned parties have won every election since 2001. Sunday’s vote count, however, which was for the lower house of Parliament, appeared to end Mr. Thaksin’s winning streak. But even if Pheu Thai had won the most votes of any party, it would have faced significant obstacles to forming a new government. A Constitution drafted by the junta ensures that the military appoints all 250 members of the Senate, meaning that army-linked forces were positioned to control a majority of Parliament, unless the opposition won the lower house by a landslide. Late on Sunday night, the Election Commission announced that it would release further results on Monday morning, leaving the counting unfinished. Another announcement delayed the time to the early afternoon. Voter turnout, at nearly 66 percent, was lower than the expected 80 percent. Nearly 6 percent of ballots were invalidated, the Election Commission reported, raising concerns about the integrity of the vote. “This election is irregular,” said Phumtham Wechayachai, Pheu Thai’s secretary general. Nuttaa Mahattana, a democracy activist who is facing four sedition charges, said that the reports of ballot irregularities paled in comparison to the overall imbalance built into the Thai political system by the military-backed Constitution. “Cheating in the election started when they drafted the Constitution,” Ms. Nuttaa said. The military’s proxy party had campaigned on stability and on defending Thailand’s monarchy. It nominated Prime Minister Prayuth Chan-ocha, the leader of the junta that orchestrated the 2014 coup, to continue in his post. Openly dismissive of democratic traditions, Mr. Prayuth has repeatedly delayed elections and overseen a diminution of political freedoms. Activists have been jailed or sent to so-called attitude adjustment camps. Cybercrime and sedition prosecutions have increased. Students who dared make the three-finger salute from the “Hunger Games” films were arrested. Even before a single vote was cast, electoral rules blunted the power of certain political blocs. The threat of dissolution or jail time for leaders hangs over several anti-junta parties, including Pheu Thai, as well as Future Forward, a youth-inspired party that was contesting its first elections and surged to third place in the partial counting. Thailand’s complicated system of apportioning seats from votes means that Pheu Thai could still win around the same number of seats in the 500-seat lower house as Palang Pracharat, but with the Senate firmly in the military’s hand, its power as an opposition party will be diminished. Uttama Savanayana, the leader of Palang Pracharat, said in a news conference that Mr. Prayuth had already called to commend him on the party’s performance. The official election results will be released by early May. With the unexpectedly strong performance by the military, it appears that the tense status quo will continue in Thailand, with the military-backed government in control and voters seeking change frustrated. On social media on Sunday night, the hashtag #prayforthailand was trending high. Ever since Mr. Thaksin, a former telecommunications billionaire from northern Thailand, swept to power in 2001, buoyed by support from the country’s rice-growing heartland, the nation has been split between an establishment elite and a populist groundswell. By some accounts, Thailand is the most unequal society on earth, and its wealth gap has only widened during five years of junta rule. In election after election, the largest bloc of voters has chosen parties aligned with Mr. Thaksin, appreciative of his parties’ health care and rice subsidies. Just as predictably, the military has launched coups, one against him and one against the government of his sister, Yingluck Shinawatra. Security forces crushed protests by loyalists to Mr. Thaksin, killing dozens. “His Majesty is concerned about the stability of the nation, the feelings and happiness of the people,” the communiqué added. Last month, King Vajiranlongkorn quashed the hopes of his elder sister, Ubolratana Rajakanya Sirivadhana Varnavadi, who had been nominated by another Thaksin-aligned party to serve as its candidate for prime minister. Hours after her candidacy was announced by the Thai Raksa Chart Party, the king issued a royal command saying it was “inappropriate,” and her political foray ended. The Constitutional Court ruled this month that Ms. Ubolratana’s candidacy was a “hostile action,” and Thai Raksa Chart was dissolved. On Friday, Ms. Ubolratana was pictured on social media at a Hong Kong wedding celebration of Mr. Thaksin’s daughter. In a highly unusual physical display for Thais, she was shown in one photo hugging Mr. Thaksin, who has been in overseas exile since a corruption-linked conviction. Nearly 15 percent of Sunday’s electorate was composed of new voters, aged 18 to 25. Thanathorn Juangroongruangkit, the leader of Future Forward, tried to carve a new path between the political forces that have dominated — and divided — Thai politics for nearly two decades. Mr. Thanathorn, the 40-year-old scion of an auto parts magnate family, ran a campaign that relied as much on an online presence as a physical one. Mr. Thanathorn, who could be jailed if a computer crimes case against him proceeds, perhaps in the coming week, said that neither the election nor the entire political system was free or fair. Human rights groups consider the charges against him politically motivated. Future Forward’s strong showing came as support withered for the Democrat Party, Thailand’s oldest party and an establishment mainstay in Bangkok. During campaigning, the party had hinted that it could lead a coalition. In Sunday’s partial counting, however, the Democrats were in fourth place. Abhisit Vejjajiva, the party leader, resigned on Sunday night, acknowledging that his party had been torn by internal infighting and had lost votes to newer political parties. For some in Thailand, the elections, however flawed, appeared to be a tool for restoring respectability to a country that considers itself one of Asia’s oldest democracies. “This election is important not only for our country but for our relationship with the U.S. and China,” said Natapong Kasemsant, a bank executive in Bangkok, who was voting at a polling station under the shade of tamarind trees. “We need a government that knows how to balance power between these two big countries,” Mr. Natapong said, declining to disclose which party he voted for but acknowledging he came from a military family.